Federal law requires drivers of commercial motor vehicles (CMVs) to receive regular physical examinations. 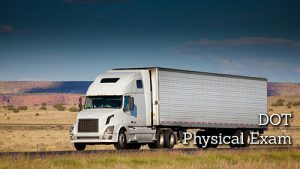 The official name for these exams is “Department of Transportation Medical Examinations,” but it’s often shortened to “DOT physicals.” DOT physicals are designed to detect physical, mental, and emotional issues that can impact a CMV driver’s ability to safely spend long hours on the road. Because there are so many regulations for commercial drivers, the Federal Motor Carrier Safety Administration (FMCSA) only allows certified medical examiners (CMEs) to perform DOT exams. A DOT exam will include an evaluation of an employee’s vision, hearing, blood pressure/pulse rate, and overall physical ability. It will also test for illegal drugs. If drivers take any medications, they’ll need to bring a complete list to the exam, including the doses and doctors’ information. Any drivers that require corrective vision or hearing need to bring their eyeglasses, contacts, or hearing aids. If your drivers suffer from any other medical condition, they may be required to bring additional information. Drivers do not need to abstain from eating before their dot physical exam. We accept walk-ins at 7:30am and at 1:00pm, but slots fill up fast! You can also call 503-362-5242 to schedule an appointment. The DOT examination will include a health history review, a thorough physical exam captured in an online version of the Medical Examination Report, and a urine test for Commercial Driver Fitness Determination. Results will be reported electronically to the NRCME when the exam is completed and certified drivers will receive a copy of the Medical Examiner's Certificate. Give us a call to schedule your DOT physical. 503-362-5242.